Comments on a blog post are a very beautiful thing, even if the comments are bitter. A bloggers feels much better if his/her blog posts receive comments. Almost all the bloggers, after posting, wistfully wish for the comments. Comments act like a life for the blogger. Comments expedite the blogging juices to a great extent. Blogging is taking a very natural curve. Blog posts are getting matured and so are the comments. Comments are not really meant to praise or blast the post or author for that matter. People are using comments to put forward their own point of view. People love to describe their opinion. Blogging has provided them that unique and treasured and aspired opportunity to express themselves without getting shouted down. They can be heard without hindrance through the comments. That is the power a person has acquired through comments, which was never there before. 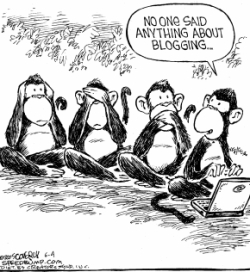 Blogs have been normally quite, cool and mellifluous, but now they are fast becoming boyuant, aggressive and hot. It may be hard to find what you are looking for in the blogs, but at least you can comment what you feel without being indulging in any sort of hassle. Anonymous comments have added yet another layer of independency and fear removal. Through comments, with real identities, fake ones and with anonymous comments, people can talk about any idea, no matter how un-popular it is. The blog’s output is information, and their product is freedom. Many idea, often the un-popular ones, in the physical world, get the more limelight and as history tells us, un-popular ideas of one time become the guiding principles of the other time. This is the most salient feature of blogs that they provide this remarkable facility of expressing the ideas in a very simple, agile and fearless way. The structure of a blog post is very natural and very interesting. There is a post blogging about some idea or concept, and that is followed by a long chain of bright,disgusting,filthy, intelligent comments, that would be impossible to obtain in the real world. Everybody likes to comment on blogs, but nobody would like to own their comments in reality.